Is this backward “D” an error? One of the more popular collector series is the Indian Head or Buffalo Nickels. Designed by James Earl Fraser, a student of Augustus Saint-Gaudens, this design was a continuation of President Theodore Roosevelt’s “pet crime” to change the look of the nation’s coinage. Introduced in 1913, the coin features a right-facing Indian head (now called a Native American head). Although there have been claims by several tribal chiefs that they were the model, Fraser’s notes suggest the image was created using the features of several men. 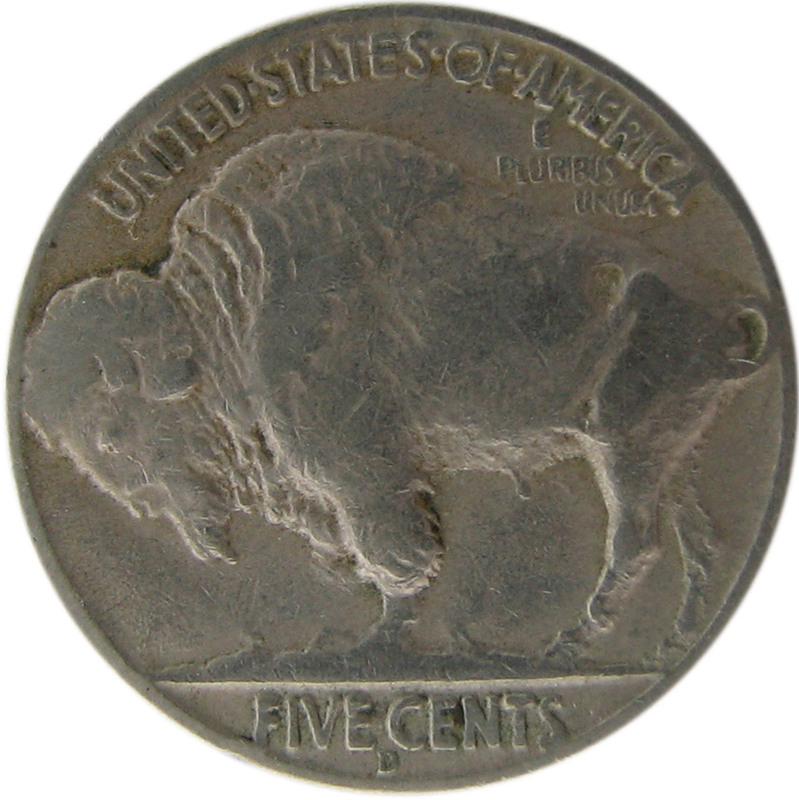 The reverse features the image of a buffalo, which in reality is a North American bison. The 38 different types of buffaloes live in Africa and feature larger horns similar to a longhorn steer. Most are domesticated and are raised like cattle is in the United States. Bison are largely wild animals native to the western hemisphere. Aside from their shorter horns, they have beards hanging from their chin and heavier coats that allow them to survive in colder climates. But that has not stopped people from referring to the coin as a Buffalo nickel. It is a design so popular that when it has been used in coinage, the available supply usually sells out. Before I receive a deluge of email, the Jefferson nickels struck from 1942 through 1945 were struck on a planchet made from .560 copper, .350 silver, and .090 manganese and features a large mint mark over the image on Monticello on the reverse. This was done to reduce the use of copper and nickel needed for the war effort. Like every five-cents coin made since the introduction of the 1883 Liberty Head or “V” nickel, the planchet is made from an alloy of 75-percent copper and 25-percent nickel. Most vending machines will not be able to tell the difference between a Buffalo nickel and a Jefferson nickel. The coin’s ability to be used in vending machines and how a worn coin could pass the unwatchful eye of a cashier, it is possible to find a Buffalo nickel in change. Although there are very few of these coins remain in circulation, avid change hunters say they can find one every 12-16 months. This was the case when a reader found what was thought to be a 1914-D Buffalo nickel. Although not a rare or key date, a 1914-D coin could be worth upwards of $70-80 in good (G-4) condition. Finding a Denver mint coin from that year would be better than finding a Philadelphia mint coin since a coin in good (G-4) condition would be worth $16-18. But this coin was different. Rather than having a “D” mintmark on the reverse, the “D” was backward! Prior to the U.S. Mint creating dies with mintmarks in Philadelphia, they would send dies to the branch mints without mintmarks. The coiners at the branch mint would use a punch to imprint the mintmark into the die before striking coins. Of course, this manual process was not perfect and there are cases of mispunched, repunched, overpunched, and other such errors. There have been cases of a mintmark that was punched horizontally into the die. Those mintmarks were repunched correctly. Coins from the San Francisco mint has had errors where the “S” is punched upside down known as an inverted mintmark. This is a fun error to find because noticing this error requires a careful eye and patience along with understanding the shape of the “S” in the font used. However, there is no reference that mentions a backward punched mintmark. Adding or removing mintmarks is a common method to artificially change the value of a coin. Remove the “S” from a 1921 Walking Liberty half-dollar and watch its value raise by 300-percent. Or practice adding a “D” to a 1914 Buffalo nickel to make a 400-percent profit. After checking several references and speaking with two dealers, I sat with a box of Buffalo nickels I have to compare the mintmarks to the one on the coin. Additionally, I consulted with the images at PCGS Photograde. After all, it could be a real, undiscovered error. The first thing I noticed on the image and with the coins I have on hand is that the mintmark on this coin is too defined for the grade. When comparing the coin to the images on Photograde, if the coin was sent in for grading it would probably be assigned a grade of G-6 of VG-8. Because of the worn rims, this coin would not grade higher than VG-8 and could be assigned a G-4. As I was looking at the coins, those that would grade VG-8 or lower with worn rims also had mintmarks that were almost worn into the rim. In more than a dozen examples from my box, the mintmarks on all of the low-grade coins showed the rims and mintmark worn together. 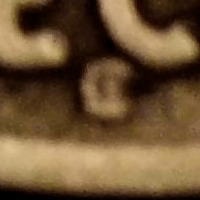 Another aspect of the mintmark that bothered me was that the “D” seemed smaller than those on the coins I was looking at. For comparison, I pulled out my album with higher grade Buffalo nickels and found that the mintmark was similar in size to those in higher grades. According to PCGS Photograde, this 1921 Buffalo Nickel represents a VG8 grade. Then there is the coloring around the mintmark. Comparing it to the examples in my box, the dirt patterns around the “D” seems off. While the coloring around all of the letters appears to be uneven, there appears to be a consistent line around the “D.” In fact, the coloring at the bottom of the “D” is inconsistent with that of the other letters around it. If I had the coin in hand, I would be able to examine it closer with a 15x loupe. I would even attempt to pick at it with a toothpick to see if the “D” would fall off. However, given all of the issues with the coin based on the images alone, I am reasonably certain that the “D” was added by someone outside of the U.S. Mint. Of course, if you have your own theories then please post them as a comment, below. PCGS Photograde images courtesy of PCGS and can be found here. This week’s LOOK BACK is my take at the stir made over the positioning of the edge letters on the newly struck George Washington Dollar coins in 2007. If you search the online auction sites, you will find less than honest sellers trying to sell variations in the positioning of edge lettering of the new George Washington Dollars errors or varieties. Letters that are pointed up, or the top of the letters towards the obverse, are considered “normal” by these sellers. Letters that are pointed downward, or the top of the letters closer to the reverse of the coin, have been called errors or varieties. They are neither. Exasperating the issue is that one third-party grading service added a designation to their labels with the orientation of the edge lettering. Images are courtesy of Ken Potter. An accepted definition of a variety “is any variation in the normal design of a given coin, usually caused by errors in the preparation or maintenance of the coin dies.” They are also errors caused in the striking process. But these definitions do not account for the differences in the orientation. The problem is that after the planchets are struck into coins by the high-speed coining machines, they are mechanically collected and fed into a machine that will press the lettering into the edge of the coins. Since the Mint is saying that the process can vary, these variations are normal for the design. Since these are normal variations, they are not numismatic varieties or errors. Thus, the coins with variations of orientation edge lettering are not worth the premiums being sought online. They are worth their face value of $1. There have been errors found with the edge lettering. The most infamous has been called the “Godless Dollars” for coins missing their edge lettering and the motto “In God We Trust.” Most of these coins were minted in Philadelphia and discovered in Florida. Others have found doubling of edge letters and what looks like breaks in the three-part collars where letters have moved out of place. These are legitimate errors and worth a premium above face value. Orientation variations of the edge lettering are not errors. If you want to consider these varieties, please save your money and visit your local bank. You can purchase these coins for face value without shipping and handling fees. If you purchase a 25-coin roll, you can spend the coins you do not want since they are legal tender. 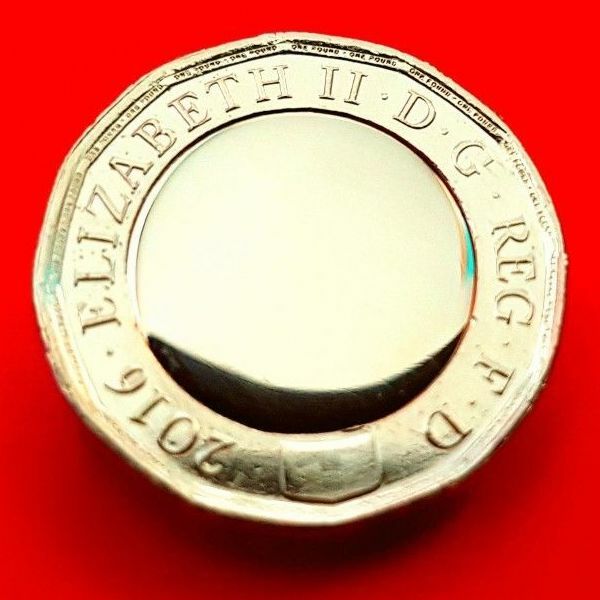 As the British are winding down the use of the Round Pound, stories are once again popping up about errors of the new 12-sided pound coin being sold for high prices on eBay. Although the Royal Mint has admitted to manufacturing issues in trying to produce enough new pound coins to satisfy circulation requirements, their claim that the number of errors where the center are missing of the bi-metallic coins is likely post-minting errors. In other words, they are suggesting that people are removing the centers of the coin to claim they are errors. To better understand why it is being claimed these are post-mint errors, I contacted a European-based dealer who has relationships with many of the continent’s mints. What follows is a summary of his explanation. The Royal Mint coins money in a process similar to any other mint. Planchets are prepared, sent the coining press, stamped, dumped into a hopper, and sent down a conveyor where they are bagged. 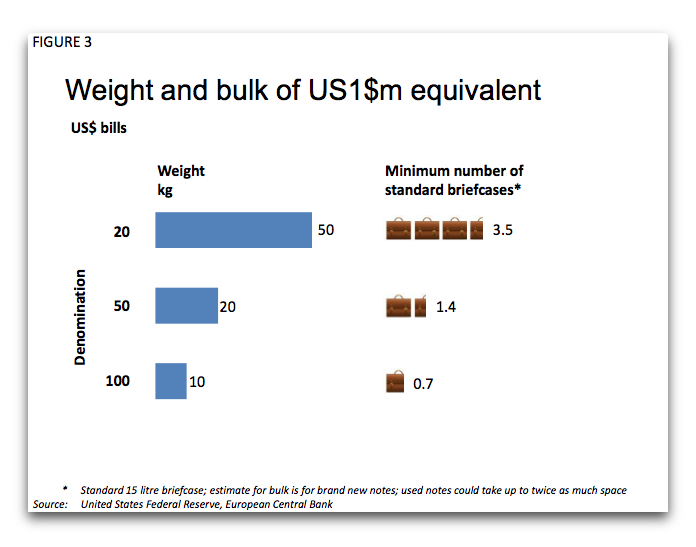 The bags are weight to a precise weight before the bags are accepted. Along the way, there are cameras and other sensors to detect errors. All of the checks and sensors, including the weight of the coin, would be caught long before reaching the bagging section. Aside from the dimensions not being correct, the weight of the ring or center by themselves would not be up to the standard. It is possible that the coins could separate in the bags during transport. However, these coins are transported to government authorized handlers. Some of them are similar to the companies that drive armored trucks here in the United States. They take the coins and prepare them for delivery to the banks. The preparation process requires coins to be counted, rolled, and bagged. As part of the process, the coins are loaded into a system that transfers them to an automated line that brings the coins by conveyor to a machine that will either roll them or dump them in a bag. In both cases, the contents are limited by the amount they hold. As part of the automated system, the coins are counted and check for size and weight so that if there are any coins that do not meet the Royal Mint’s standards are removed. The automated system would catch the ring and the center if they separated before the process. Coins that are to be rolled are sent to a machine to roll them where they are counted and placed in rolls of £25 each. Those rolls are for bank and retail use and handled accordingly. Bagged coins are used by bulk handlers such as the coin-op industry. Bags with £100 of coins are counted before being placed in the bag. If the coin cannot be verified before it is placed in the bag then the coin is rejected. Is it possible for the coin to separate in the £100 pound bag prior to circulation? Of course, it is. However, there is one more check before the coins reach the consumer, and that is the coin-op machine itself. Coin-op machines have mechanisms to try to prevent accepting counterfeit money and to ensure it is giving the proper change. Machines just do not eject any coin in its hopper. These checks include the weight, dimensions, and magnetic signature. The magnetic signature measures what happens after magnetic energy is flashed on the coin. Think about it as measuring how the coin would reflect light but use magnetism instead. 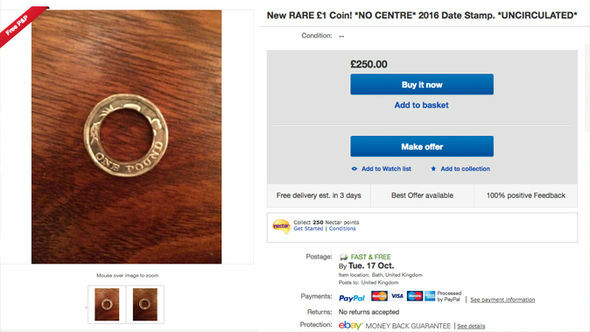 A pound coin that had separated would not pass the magnetic signature test and be rejected. Although there are a number of points along the process that could fail, the number of checks between the Royal Mint and the consumer, it is highly unlikely that all of these separated pound coins exist. It is possible that the coins being sold are from the reject bins of coin-op machines. However, the dealer I spoke with is suspicious of the number of coins being sold. This dealer told me that he will not buy 12-sided pound coins dated 2016 without their centers. Technically, they are not coins because they originally did not have the portrait of Queen Elizabeth on the front. Under British law, all legal tender coins must have the image of the monarch on the front. In 2016, the Royal Mint created about 2000 of these 12-sided test slugs for businesses to test coin-op systems ahead of the conversion. The dealer community has serious doubts that the test slugs had these errors and believes that people separated the centers from the rings. 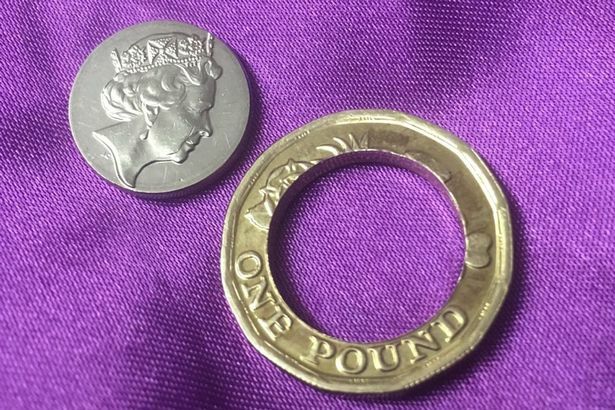 My dealer contact said that nobody should pay more than “three-and-a-half quid” (£3.50 or $4.64 at the current exchange rate) for just a 12-sided pound outer ring. Even if it is not a legitimate Royal Mint error it is a nice conversation piece. Too hard of a strike is likely to have caused the copper-nickel center to melt across the coin. Ebay image courtesy of the Daily Express. Altered coin image courtesy of AOL (UK) Money. Error images courtesy of The Sun. Fans of the NBC show The Blacklist that watched on Wednesday, October 4, would have noticed there was a numismatic role added to the script. Raymond Reddington, played by James Spader, was trying to gain the attention of a high-rolling thief and found himself at a numismatic auction. The item up for bid was the 1943-D Bronze Lincoln cent. As part of the story, it was announced that it was the only one known to exist and that it was graded by the Professional Coin Grading Service. Currently, there is only one known 1943-D Bronze Lincoln Cent and was graded by PCGS to be MS-64BN. It last sold for $1.7 million in 2010. Since then, more 1943 Bronze Lincoln Cents were found including a 1943-S graded MS-62BN by PCGS. That coin was sold to Bill Simpson, a co-owner of the Texas Rangers, for $1 million in 2012. Simpson owns a complete set of 1943-PDS and 1944-PDS off-metal Lincoln cents, the latter made of zinc coated steel. In the show, the hammer price was $3 million. All things considered, it is probably an accurate estimate of what the coin might be worth if it were to come to market today. Of course, they did not use a real 1943-D Bronze Lincoln cent and there was a mistake when the coin showed up later in the story. But if you have not seen this episode, I am not going to spoil it for you! Image courtesy of PCGS CoinFacts. A variety is a coin that differs from its basic design type in some distinctive way and is thus differentiated by collectors. Varieties are not errors. They are deliberate changes to the design whether it is to better define the design, adjust the design to strike better, or to add or change elements like dates and mintmarks. A key difference between a variety and an error is that varieties are replicated for multiple strikes. Die changes, repunched mintmarks, repunched dates and over polishing of dies can reproduce the variety for the life of the die or until it is detected by Mint workers. Nearly every series of coins has its own traceable die varieties that have been studied and catalogued by researchers. Researchers assign the varieties a number that is used by the third-party grading services to provide attribution to the variety on their holder. Cohen (C#) Half Cents (1793-1857) American Half Cents – The “Little Half Sisters” by Roger S. Cohen, Jr.
Arguably, the most collected series by varieties are Morgan Dollars. VAM varieties and catalog numbers were introduced to the hobby by Leroy Van Allen and A. George Mallis who discovered the varieties while examining Morgan and Peace Dollars. Their book, Comprehensive Catalog and Encyclopedia of Morgan & Peace Dollars began a hunt that has seen hundreds of more varieties found and cataloged. Most VAM varieties cannot be seen without magnification and detailed knowledge of what to look for. The primary resource for VAM collectors is the VAMworld website. Aside from listing the identified VAM varieties, there are instructions how to identify VAM varieties. General searching for varieties and errors should consider picking up a copy of Cherrypickers’ Guide to Rare Die Varieties of United States Coins by Bill Fivaz and J.T. Stanton. The book comes in two volumes. Volume 1 covers die varieties of half cents through nickel five-cent pieces. Volume 2 covers everything else including gold and bullion issues. Over the years, I have been asked what are the differences between errors and varieties. While some errors are distinctive, some wonder why some errors are not varieties and some varieties are not classified as errors. A basic rule of thumb is that even though errors and varieties represent changes to the basic design of the coin, they differ in how they occur and the resulting appearance of the coin. A Mint Error is the result of an issue with the manufacturing processes causing the coin to be damaged in some way. Errors can be the result in malfunction of the equipment, imperfect coining materials, or created by human error. Even though modern equipment is supposed the make the striking process more consistent, when the manufacturing process involves striking billions of coins, there are bound to be a few errors. Coining machines have so many moving parts and everything has to work in concern, one variation in speed, force, vibration, or tilt can make the coins look very different than intended. Then there is the human factor. Humans are imperfect beings subject to making mistakes. Even though the machines are supposed to help guide the humans to reduce mistakes, something can go wrong, especially in an operation that involves making billions of the product. To help understand where some of the mint errors come from, they can be categorized as three different types: Planchet Errors, Die Errors, and Strike Errors. clipped planchet: Term used to describe a planchet that may have been cut incorrectly from the metal sheet. The clipped area may be curved if cut into the area where another planchet was cut out or straight if cut beyond the edge of the metal strip. delamination: A form of planchet flaw caused by imperfections in the metal whereby a thin strip of the metal separates itself from the coin. lamination or planchet flaw: Lamination is a type of error in the planchet that occurs when a thin layer of the metal splits or peals away from the surface of the coin. off metal or wrong planchet: A type of error that occurs when a coin is struck on a planchet that it is not normally struck, such as striking of a quarter on a planchet that was supposed to be for a nickel. cud: The area of a coin struck by a die that has a broken area across part of its surface. The result appears as a blob of metal on the surface of the coin. die break or die crack: Fine raised lines can appear across the coin when something causes the die to break or crack. A cracked die opens a fine line in the design allowing the flow of metal to fill in the space when struck. 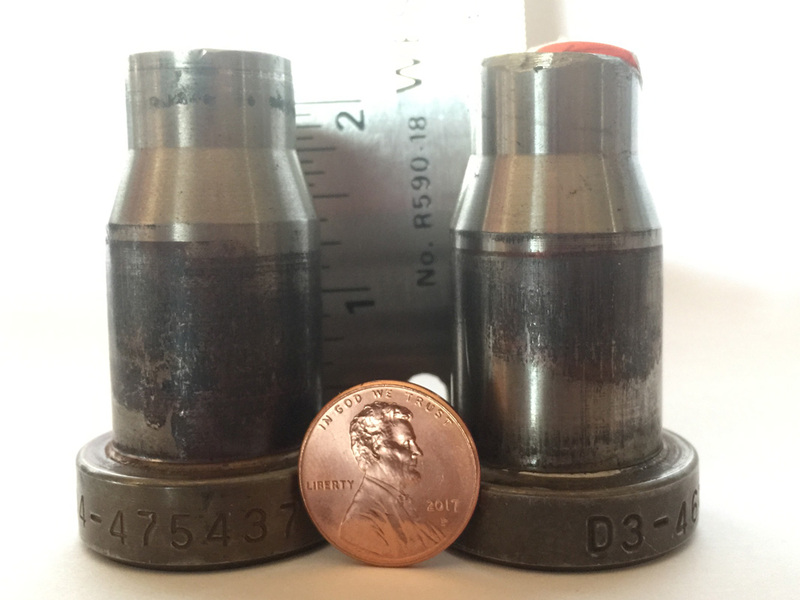 filled die: A type of error that appears on a coin when a foreign substance, such as grease, fills the elements of a die used to strike coins. 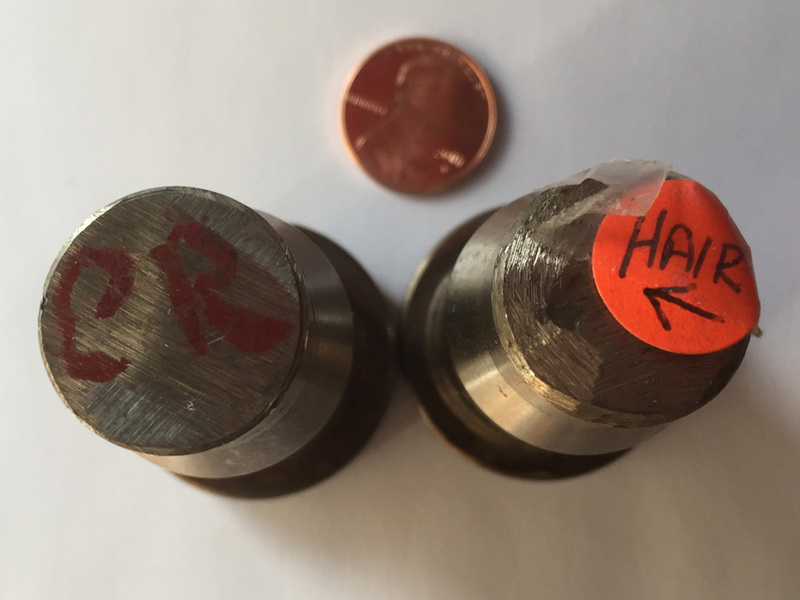 A filled die error can also occur when the dies are polished to remove debris during the striking process. Modern minting processes have eliminated the polishing of dies but the problems with filled dies continue. hub doubling: Refers to the doubling of the elements on a coin that was caused by the hub being pressed more than once into a die in different angles. Hub doubling occurs prior to the striking process when the dies are created. Master hubs are pressed into the dies to create working dies for the coining process. Mistakes in this process can result in the production of many coins with the error struck into them. mule: A mule is a type of mint error that occurs when a coin is struck with two dies that were not intended to be used together. Two of the most famous dies errors are the 1955 Double Die Obverse (DDO) Lincoln cent and the 1937-D Three-Legged Buffalo nickel. The 1955 DDO Lincoln cent and is known as the King of Errors. It is the result of hub doubling that created the double-looking lettering on the coin. It is the coin that really started the error collecting segment of the hobby. The 1937-D Three-Legged Buffalo nickel occurred when a mint worker polished the reverse die of the Buffalo nickel too aggressively without checking his work. The result was the front-right leg of the buffalo being eliminated from the die. A few thousand were created before the Mint officials figured out they had a problem. The strike occurs when the top die, usually the obverse, is pushed with such forced on a planchet sitting in a position on the anvil dies, usually the reverse, that will make the impression on the coin. Strike errors are the result of a mechanical problem that occurs during this process. broad strike: A coin that is struck in a way that expands beyond the boundaries of the collar. A broad strike can give the coin n flat or elongated look. brockage: A type of striking error when the coin is not ejected properly from the press and causes the mirror image of the exposed design to be struck on the next coin. capped die: An error in which a coin gets stuck on a die and remains stuck for successive strikes. Eventually, the coin forms a “cap” on the die and imparts its image on coins it strikes. When the cap falls off, it usually resembles a small bowl. clashed die: One of the more interesting errors occurs when during the striking process, a malfunction prevents a planchet from being in place when the dies are forced together causing them to crash into each other. This leaves the design from either side on the other. Subsequent coins are then struck with the latent image of the other side pressed into the coin. cracked die: An error that occurs when during the stress of striking coins, the die cracks across its face. When a cracked die strikes a coin, the metal flows into the crack that impresses a raised area in the coin that is not part of the design. filled die: A type of error that appears on a coin when a foreign substance, such as grease, fills the elements of a die used to strike coins. incomplete strike: A coin that is missing design detail because of a problem during the striking process. misaligned dies: A striking error caused by one or both dies not set properly in the coining machine or worked loose during striking. multiple-struck: A type of mint error when the coin was struck more than once. A multiple-struck coin can show the design as it is struck in multiple places. off-center strike: During the striking process, the coin is not seated in the right place in the area over the anvil (lower) die causing the coin’s design to not be properly centered on the coin. overstrike: A type of minting error when a coin, token or medal is struck on a previously struck coin, token or medal. 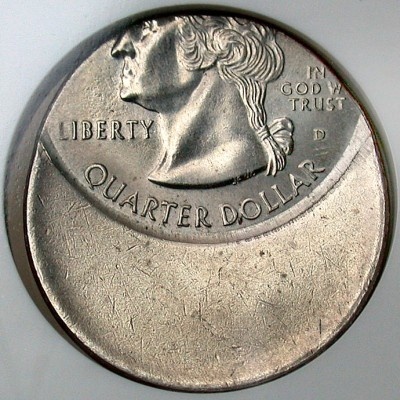 partial collar strike: A type of striking error where a planchet does not enter completely into coining position and is struck partly within the collar and partly outside. rotated dies: A type of mint error caused by the dies not being aligned when striking the coin, token or medal. 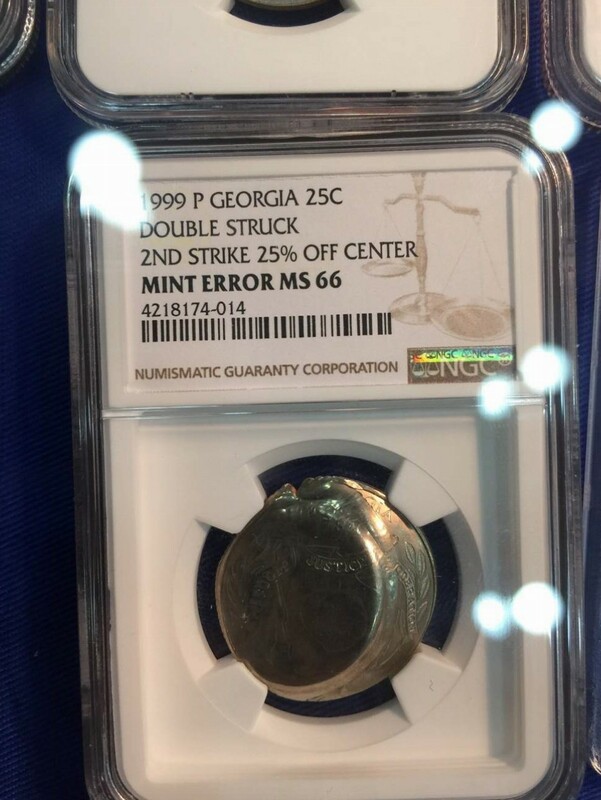 1999-P Georgia state quarter double struck and off center. strike doubling or doubled strike: A coin that is struck more than once while in the coining machine resulting in doubling of design elements. Double strikes are different from hub doubling in that this type of error is a mechanical failure within the coining machine whereas hub doubling happens before striking. Double strike errors are rarer than hub doubling. weak strike: refers to a coin that does not show its intended detail because of low striking pressure or improperly aligned dies. When going to coin shows you can see some of the most fantastic errors. Some boggle the mind how they were done and how they escaped the U.S. Mint. Dealers whose concentration are errors do not reveal their secrets but I have been told that some have contacts with some of the security companies that haul money on behalf of the banks. This topic is not complete until we talk about varieties. That will be the next post. Dime struck on a nail image courtesy of Heritage Auctions. 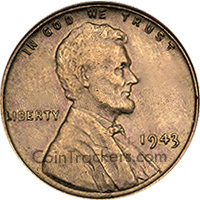 1943 Copper Lincoln cent off-metal error image courtesy of CoinTrackers. Is numismatics really dying as a hobby? Although I owe you my impressions of the U.S. Mint’s Numismatic Forum, giving it the proper treatment I think it deserves has taken longer than expected. Rather, let me jump ahead to a recurring theme that takes over the conversation on the state of the hobby: Numismatics is a dying hobby of the old. MYTH: Electronic transactions have taken over and hard currency is being used less. FACT: Electronic transactions make up only 13-percent of retail purchases in the United States and 7.1-percent worldwide. Although the pundits like to point out that trillions of dollars change hands electronically, this includes non-consumer-related transactions such as bank transfers from one account to the other using the Automated Clearing House (ACH). If your paycheck is deposited directly into your account, it is transferred using the ACH system. In real money, the International Monetary Fund estimates that the U.S. 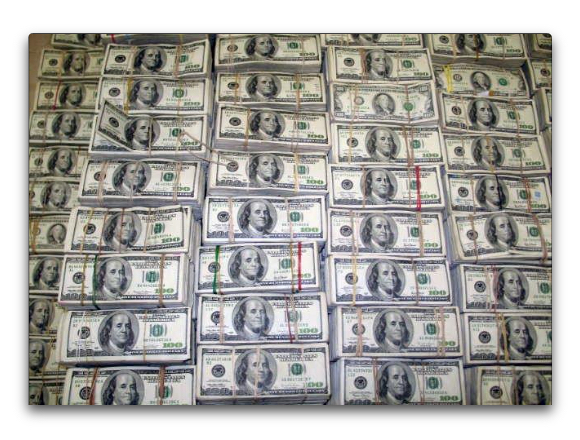 Gross Domestic Product (GDP), the total costs for all goods and services, to be $18,561,934,000,000 ($18.561 trillion). If 13-percent of that is electronic retail purchases, that means that $2,413,051,420,000 ($2.413 trillion) is made not using cash. What about the other $16.1 trillion dollars? Depending on which report you read, electronic transactions should grow at a rate of 8-10 percent annually. Even if the U.S. GDP is on a pace to grow by only 1.4-percent, adding about $250 billion in electronic transactions will not make a significant dent in the rate of electronic transactions. Of course, the U.S. are not spending $16 trillion in cash transactions, but both the U.S. Mint and the Bureau of Engraving and Printing are on course for record production years. Year-to-date, the U.S. Mint has produced $870,133,500 in circulating coins (not including half-dollar, dollar, and commemorative coins). For Fiscal Year 2015 (October 2014-September 2015) the BEP produced $166,302,000,000 ($166.302 trillion) in currency (not including $2 notes). 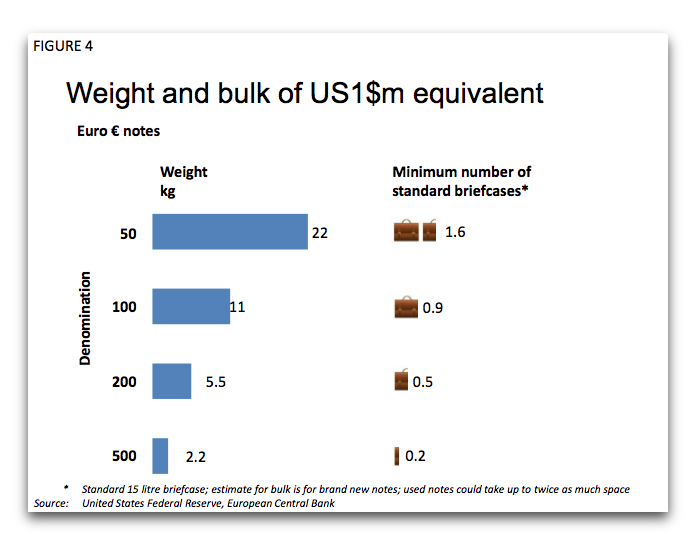 Although some of the currency does replace worn notes (the BEP reports that 90-percent of $1 notes replace damaged notes) and a significant portion of the $100 notes are shipped to banks overseas, which represents quite a number of transactions. Although electronic payment options make up 13-percent of all cashless transactions you have to remember that this market barely existed a few years ago. Even as banks and large retailers push to increase the number cashless transaction, there are problems that society faces when moving to a cashless retail system. The biggest problem is one of scale. The United States makes more money, spends more money, trades more money, and has more economic impact than any other country in the world. It is the world’s single largest economy with a strong capitalistic culture where most of the commerce is done with small businesses. Amongst all business, 55-percent of retail merchants are cash-only enterprises. They are too small to consider paying the 3-to-5 percent fees for using a credit card, known as the “swipe fee.” Of those that do take credit cards, at least 36-percent require a minimum purchase. MYTH: The sharing economy is turning the economic world upside down changing the way we will pay for goods and services. FACT: Human beings have been sharing and trading goods and services from the dawn of time. You killed an ox and have the hide left over. I have a lot of fruit I picked that I cannot eat. I will give you an amount of fruit and you give me the hide. Money was created as a medium of exchange when I did not want your fruit but wanted some of the goods someone else had. It was the pre-historic version of the three-way trade. Some of us grew up trading. I remember trading a Mickey Mantle baseball card for a Jerry Koosman and two Donn Clendenon cards —one from Houston and the other from Montreal, just after the Mets traded for Clendenon. I thought I gave the kid a deal because 1969 turned out to be Mantle ’s last year. What has changed since I made the trade? There has been a tremendous change in technology. While we set the price for the baseball cards we traded, now there are price guides, electronic markets, auctions, and online trading sites. Even in other categories, you might place a classified ad in a newspaper or an advertising rag like PennySaver or something like Uncle Henry’s in Maine. Now there are sites like Craigslist, AirBnB, Uber and Lyft that expands the market. Pundits like to point to the sharing economy’s growth. The problem with the reports is that this version of the sharing economy has gone from nothing to something with a lot of press coverage. Anytime there is something shiny and new it grabs the attention of the public before they move on to the next distraction. We share numismatics all of the time. We go to shows and display our collections for competitions. We enter registry sets to try to create a nice collection or even worst collection with the advent of “low ball” sets of coins of very low grades. We blog and read about other’s collections. We post finds to public forums and sometimes bring our collections to show off at club meetings. Sometimes we even trade. Have you traded a few Barber dimes for a Barber half because you needed the half for your collection? How about three Morgan dollars for an elusive 1921-S Walking Liberty half-dollar? The only difference between this and the new sharing economy is the lack of computer interface. Sometimes that human interaction is more fun than hiding behind a screen. MYTH: People, especially millennials are not interested in collecting anything. New Zealand Mint produces Monopoly coins for the Island nation of Niue. 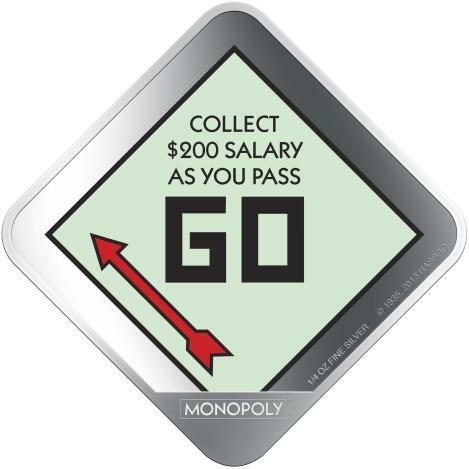 Did you pass Go? FACT: The Hobby and Toy industry is estimated to be a $20 billion business with an estimated growth of 1.6-percent over 2015. Not all of the emphasis is on electronic games and gadgets. One study found that more money is pledged for projects on the crowdfunding site Kickstarter than any other category. One of the fastest growing sectors of this market is board games. While some games do incorporate electronics into their play, this new generation of gamers is finding that social gaming can be as much fun as their online endeavors. Numismatics has never been a welcoming hobby for the mid-to-lower level collector. Dealers who are older may have a difficult time relating to younger and, frankly, a non-white demographic (see my post about one such incident here). It has created a culture of cranky older Caucasian collectors who think that their way is the only way to collect. It is not just the dealers. Mainstream publishers put a lot of effort into creating references and collecting supplies that satisfy the market as being pushed by the dealers. Even worse, while the American Numismatic Association does recognize other aspects of numismatics, the fact that most of the Board of Governors are in the coin business with years of experiences in the coin business, that becomes the focus of the ANA. It is time for the industry and its representative organization, the ANA, to remember that numismatics is more than coins. Currency, exonumia, scripophily, and even military medals are all part of numismatics. Concentrating on coins, especially coverage of high-value sales scares off many novices who may be willing to look at coins as a hobby. When I go out to schools in the Washington, D.C. metro area, I will bring enough Metro (the local transit system) tokens for everyone in the class. After buying a bulk bag of tokens, I have plenty to give away along with the story of how they were once used. But it allows me to show the students that numismatics is more than coins. I explain how I sit at junk boxes and at the tables of token dealers to find items from my hometown of New York. When I show them four pages of 2x2s with tokens and medals from New York and say that in three years I may have spent as much as $200, they seem to understand that you can have fun without spending a lot of money. 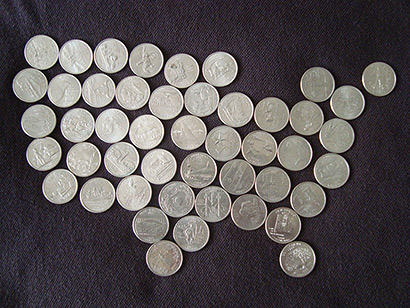 MYTH: We lost those who collected the state quarters forever. FACT: We also retained a lot of those collectors. Unfortunately, we damaged many others. What made the state quarter program popular was that the way it was administered made everyone a stakeholder. Rather than dictating the design, states were encouraged to allow public participation to help decide on their quarter’s design. Contests and state pride went into the quarters that allowed each state to celebrate their home state. Ordinary people were brought into the process and ceremonies held in each state announcing the designs and on the release of the quarters. Of course, the state quarters were also the hobby’s demise as television hucksters sold overpriced junk surrounding the sets. Colored coins and “special” sets were sold at high prices with the hint that they would only increase in value. When these people tried to cash in on their “investment” they found they overpaid, became angry, and may not come back. During this time, the ANA was nearly non-existent in the education process as it was undergoing its own internal political battles. Without someone to help stand up for the hobby to help educate the public, the industry suffered. Although the ANA has improved in many areas, it continues to be about coins with a slant toward classic (pre-1965) and rare coins. The only modern coins that seem to get any amount of respect from the community are commemoratives, bullion, and errors. With the so-called modern era being 52 years old, it is time for the old and crusty of the numismatics industry to either get on board with that it is new to the new collectors or maybe it is time to consider retirement. The lesson I have learned in numismatics as well in my business of buying and selling collectibles is that in order to expand any hobby it has to be made into something personal. Sports collectibles sell memories of your heroes. Space collectibles sell the mystique of outer space. Automobilia seems to have a fascination for a lot of people even as what was considered modern nameplates like Plymouth and Pontiac have gone the way of DeSoto and American Motors. Hobbies have to also be interesting. Is it really interesting to collect a series of all of the same coins where the only difference is the date or mintmark? Again, why does a collection have to be biased for coins? Can someone have fun collecting So-called dollars, transportation tokens, or even unusual coins? I think about how much fun Charmy Harker might have had to put together her award-winning exhibit Penny Potpourri with things made out of pennies. If you have not seen her exhibit, you can find images here. It has to be one of the best exhibits I have ever seen because it is unusual. I like things that are different. In order to get people interested in the hobby, you cannot introduce it to them by showing a 1909-S VDB Lincoln cent or a 1937-D 3-Legged Buffalo nickel as an example. Not only are these coins difficult to find and less affordable, but not everyone may be interested. I like to use my two-pages of 2×2 holders with a set of transportation tokens with every letter of the alphabet cut out of the center, except “Q” and “Z,” along with some that have shapes. When I tell someone I paid around $50 for the initial investment and can buy most tokens for less than $5 each, they want to know how they could get started. If you want to start with coins, go find a folder of currently circulating coins and see who can fill their folder first only from pocket change. I recommend either Lincoln Memorial cents, which can be interesting finding S-mint circulating cents on the east coast, or Jefferson nickels (for fun, use Whitman Jefferson Nickel folder #2). Another idea for collecting coins is to make a collection based on a theme. Ideas for themes can be the year you were born, coins with an animal like buffalos, or create a type set that represents some of the subtle changes in a long series like Lincoln cents. There are more to exonumia than transportation tokens. If your state issued tax tokens in the early part of the 20th century then how about finding examples for a collection. Tokens are still being created for gaming, casino chips, parking tokens, or store tokens the pre-cursor to paper coupons. Advertising tokens can be a fun way to collect your hometown. Tokens with themes, shapes, and cutouts can be a lot of fun. Go beyond tokens to encased coins. Encased coins have been used as a private commemorative, advertising, and I even found one for an electric supply company that promised money off if you returned it to their store. You can collect elongated cents, also called squished pennies, from almost anywhere. Recently, I found a machine in the Philadelphia Mint’s gift shop. For 51-cents, each I was able to buy two souvenirs. Collecting elongateds also helps you keep the record of where you have been. And I didn’t mention currency or scripophily. One cool idea would be to collect stock certificates representing what you might find on a Monopoly game board. If you have other suggestions, send it as a comment! Now go out and start a collection. Recruit a friend and do it together. 50th Anniversary medal from the Inwood Country Club. Reverse of the Triborough Bridge and Tunnel Authority Rockaways resident token. Series 2003 $2 Star Note from the Federal Reserve Bank of New York. Rosario Marin/John Snow signatures. Coin collecting image courtesty of about.com. Quarter map image courtesy of the Continental Mint. The list has only one “reasonably priced” coin—that is a coin that someone with a little means could afford. It lists the an 1850 Double Eagle at $13,000. That started me to think about the potential to actually owning a few rare collector coins with value and something more align with my tastes. After thinking about this I came up with a list of my “10 Most Desired Coins Within Reason.” In this case, I defined reason as not being so rare that it could only be bought with the help of a good dealer and would not require bidding on it at a once-in-a-lifetime auction. I also set a limit of $5,000 on the price of any coin. I know this may limit the inventory to lower grade for some coins, but those lower grades could give the coin character. 1793 Flowing Hair Chain Cent with AMERI. in Legend is basically amongst the first legal tender coins produced by the U.S. Mint. I know that there was an earlier run of half-dismes, but they were not real production runs. If I am going to produce a list like this, I am going to pick the coin I like and break one of my rules because even at its lowest grade, the coin will probably cost more than $10,000. 1909-S Indian Head Cent in Mint State Red. Even though the 1908-S was the first Indian Head cent struck in San Francisco, I am choosing the rarer of the two S-mint Indian Heads in Mint State Red. Of course, this may also break my budget but it would be no fun otherwise. 1909-S VDB Lincoln Cent may not be the most expensive Lincoln Cent (the 1914 is), but it is the first of the iconic series and part of the controversy started because of the “V.D.B” initials on the reverse. Fortunately, I already own one graded as VF-30BN by NGC. 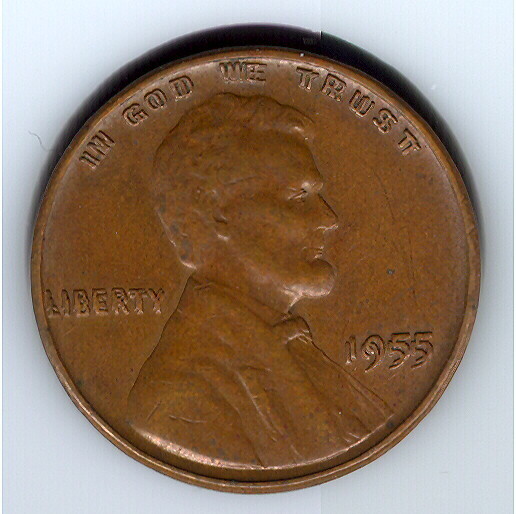 1955 Double Die Obverse Lincoln Cent is the coin that sparked the interest in error collecting. It is remarkable to think that one coin, a mistake, created a new segment of the hobby. For me, I already own one graded AU-58BN by NGC that I really like. 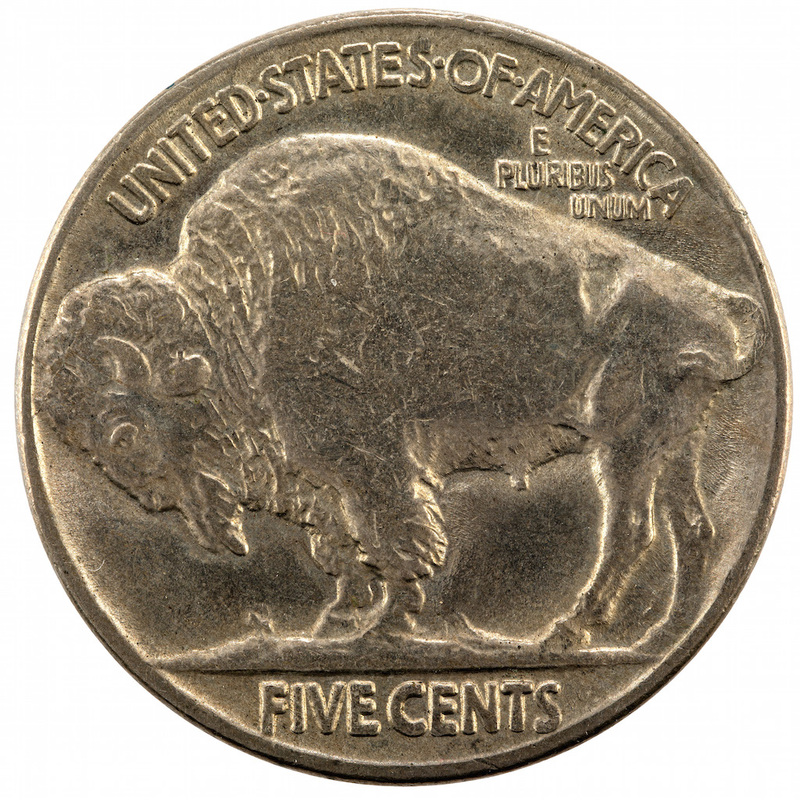 1937-D 3-Legged Buffalo is a very cool coin. Aside that the Buffalo Nickel is one of my favorite coin designs, there is something intriguing about the story behind this coin. Fortunately, the one I own was graded VF-25 by NGC and the last of the ones I already own on this list. 1917 Type 1 Standing Liberty Quarter is a compromise because the 1916 would be too expensive. In order to add a type 1 design (with breast exposed), the 1917 version is more reasonably priced in higher grades. 1921 Walking Liberty Half Dollar would be the coin I would point to on this list as being my favorite design. For me, only the Saint-Gaudens Double Eagle come close to Adolph Weinman’s design. It should not surprise anyone that Weinman was one of Saint Gaudens’ students. The 1921 half dollars were almost an afterthought as the U.S. Mint was rushing to produce silver dollars and the 1921 fits the criteria to buy one in higher grades. 1878-CC Morgan Dollar in the GSA Holder because it is interestingly historic. The Morgan Dollar was authorized by the Bland-Allison Act that required the Treasury Department to buy silver from western mines and put them into circulation as silver dollars. It was passed after the Coinage Act of 1873, sometimes referred to as the “Crime of ’73,” demonetized silver and set the standard for gold as the backing of the national currency. Not only do you get the collectible from a western state near a western mine, but the GSA Holder is from the historic sales of the 1970s after the GSA started pulling coins out of storage in buildings long forgotten. 1908 Indian Head Gold Half-Eagle because if you make a list like this, there has to be some gold on it. If I am going to do a gold coin, I want the only coin whose design is incuse to the coin. Bela Pratt Lyon’s incuse Indian Head design is unique and nicely available in its first year of mintage. 1907 No Motto Saint Gaudens Double Eagle because this list cannot be complete with the other of the two most iconic designs ever made for a circulating coin. Since 1907 is the first year, this is the most affordable of the three types made that year and is more available than the high-relief versions. Do you have a similar list? Add it to the comments below.